10 Sep 2018 --- The FAO Food Price Index remained stable in August, as cereal prices rebounded while vegetable oils and sugar declined. The monthly index averaged 167.6 points last month which is virtually unchanged from its revised estimate for July and 5.4 percent below its level in August 2017. The FAO Cereal Price Index – which is a measure of the monthly change in international prices of a basket of food commodities – jumped 4 percent during the month with wheat prices rising twice as much due to deteriorating crop prospects in the European Union and Russia. International maize quotations rose by more than 3 percent while rice prices eased during the month. The latest FAO Price Index comes at the same time as a detailed wheat crop review by Limagrain Céréales Ingrédients reveals problems with this season’s wheat crop caused by drought as well as challenges for Russian exporters anticipating restrictions to be enforced by the government. “These declines of production have international implications. Europe will be exporting much less wheat this year, compared to last year and other exporters will have to fill the gap. Russia has been the number one exporter for the past two years and they have their own difficulties. They have exported less than Europe last year, which is putting more pressure on other exporters, including Australia, Canada, Argentina and the US. This leads to higher prices of wheat which we have seen over the last few weeks and restrictions on exports,” he explains. “Europe, in this regard, has played a role when it comes to international levels and the FAO Food Price Index and all the other commodities have felt this downward pressure. 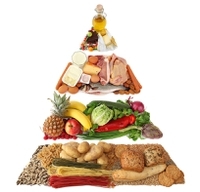 Europe has its own issues and this is separate from what we have shown in the Food Price Index. The UK has been hit by its own crop situation and has seen higher import prices as a result,” he notes. “Germany is one of the countries which has been worst hit when it comes to the harvest, specifically for wheat and corn, which has seen quite a lot of issues. Overall, on the continent, we have a situation whereby prices will be hugely effected within the European Union,” Abbassian says. The FAO Vegetable Oil Index declined 2.6 percent from July, nearing a three-year low as palm, soy and sunflower oil quotations all fell amid favorable production trends and in the case of palm oil, weak global import demand. The FAO Sugar Price Index dropped 5.4 percent from July to reach the lowest level in a decade, primarily due to the continued depreciation of the currencies of significant exporters Brazil and India. The FAO Meat Price Index was broadly unchanged on the month, as pigmeat and ovine meat quotations increased on strong import interests from China, offsetting declining poultry and bovine meat prices, with the latter under pressure by high export availabilities from the US. 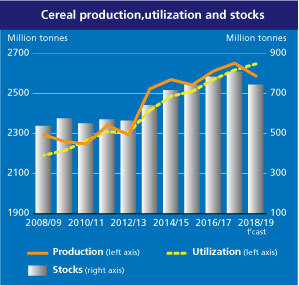 FAO now forecasts global cereal production in 2018 to reach 2,587 million tons, a small upward revision from July but a three-year low and 2.4 percent below last year's record high level Click to Enlarge. The latest Cereal Supply and Demand Brief cut by a notable 14 million tons the world wheat production forecast for this year, which now stands at almost 722 million tons, the smallest crop since 2013. Dry and hot weather intensified yield reductions around Europe. On the other hand, worldwide production of coarse grains was revised up by 15 million tons since July with improved outlooks for maize in China, Ukraine and the US, more than offsetting expected output reductions in the EU and Russia. FAO now expects 2018 coarse grain output to be nearly 1 354 million tons, 2.6 percent below the level of last year. Meanwhile, world rice production is expected to increase 1.3 percent from the previous year and reach a new record of almost 512 million tons in 2018, buoyed by more substantial output recoveries in Bangladesh and Vietnam and stronger area rebounds in Sri Lanka and the US. FAO raised its forecast for world cereal utilization to 2,648 million tons, mainly due to greater use of maize for feed and industrial use and the robust rice harvest. Cereal stocks are also being reduced – especially in China, the EU and Russia and the global cereal stock-to-use ratio is expected to slide to 27.3 percent, a five-year low. The forecast for world trade in cereals over the 2018/2019 season has been revised up to nearly 414 million tons, approximately 1.5 percent below the previous year's record high.